Ghosts walk much of the American Southwest, and nowhere is their silent presence more strongly felt than along the steep walls of the many canyons that slice the high tablelands of Mesa Verde National Park. Although nearly 700 years have passed since the last of the people known to the Navajos as Anasazi, or “Ancient Ones,” left the complex community they had built here, something of their vital spirit remains to resonate in the souls of modern visitors. 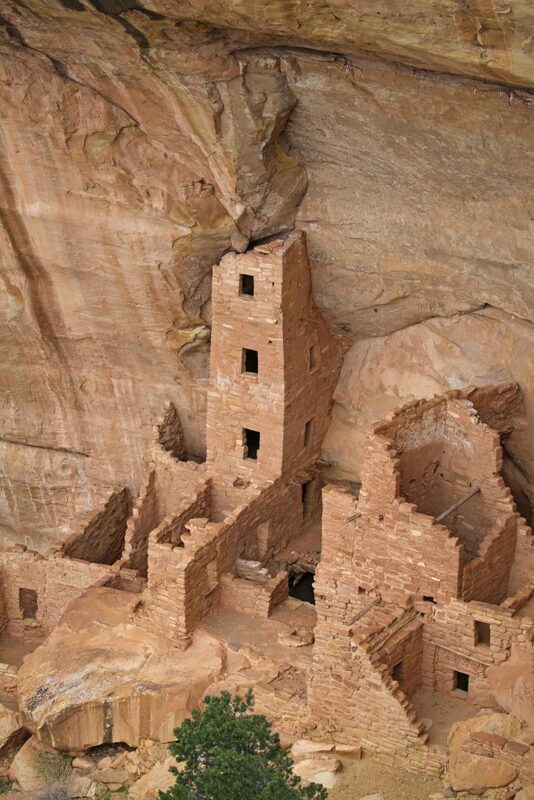 Standing in the courtyard of Cliff Palace or Long House, the two largest cliff dwellings, one can imagine the shrill sound of children at play, sense the murmur of sandaled feet, envision a group of women grinding corn, and catch the echo of drums and chanting voices from a kiva’s depth. But to do so is to touch only the most recent history of this place. For the magnificent cliff dwellings that are the park’s main attraction are but the capstone of a culture that grew and flourished here over a span of about 750 years. The true spirit that inhabits Mesa Verde is the legacy of a civilization , the accumulated experience, hope, skill, faith, and understanding of all the generations who built that society, lifetime upon lifetime. Those who first came here, about A.D. 550, were descendants of nomadic peoples who had roamed the Southwest for thousands of years, hunting with stone-tipped spears, gathering wild plants where they found them, and occasionally growing a little squash. Their immediate ancestors , beginning about the time of Christ , are known as Basketmakers because of their skill of weaving the fibers of the yucca. So finely woven were many of the baskets they made that they could be used for carrying water and even for cooking: hot rocks were dropped into baskets of water. By the time the offspring of these early people came to Mesa Verde, they had entered a stage of development that today’s scientist call the Modified Basketmaker Period. They knew how to grow corn, a grain that does not seed itself in the wild, and so they had a good reason to stay in one place. This dependable food supply had given them time and energy for improving tools, weapons, and other utensils. Families were larger and so were overall populations. Thus they came looking, not merely for good hunting grounds, but for a place to settle down, till the soil, and create a community. They found the land atop the great mesa much as it is today. Forests of pinyon pine and Utah juniper promised a good supply of wood for homes, fires, tools, and weapons. Broad mesa tops offered a wide array of plants, especially yucca, and supported a healthy population of mule deer, wild turkeys, and other game. Seeps and springs were a steady source of water; and the thunderstorms of summer , the result of the mesa’s abrupt rise above the surrounding valley , were ideal for growing corn in the deep, rich, reddish soil that had been dropped here, a dry grain at a time, by southwest winds. The simple pit houses built by these first permanent inhabitants of Mesa Verde began as shallow holes in the ground, circular pits a few feet deep dug with crude wooden tools. The soil was carried away in baskets. Then the men went out and cut four straight poles of pinyon pine, which they set into four evenly spaced holes within the pit so that the tops were about head high. Four smaller poles became crossbeams to support a roof of additional poles, sticks, and barks. The walls, leaning from the edge of the pit to the crossbeams, were of the same materials. The whole structure was then covered with mud, which baked in the hot sun to a hard, stuccolike finish. The entrance to this weatherproof mound was by ladder through a hole in the center of the roof; in the winter, when a fire was built, the smoke escaped through the same hole. Dug into one end of some of these houses was a storage room, or anteroom, and occasionally this was designed to serve as an burrowlike second entrance. They were small, sturdy people, few stood as tall as five and a half feet, who worked hard to stay alive. Although the small patches of corn and squash that they grew near their pit houses gave a measure of security, they still looked to the wild for most of life’s necessities. The bulbs of sego lilies, the spring shoots of Rocky Mountain bee plants, the leaves of Mormon tea, and the seeds of pinyon pines were among the myriad treasures to be gleaned from forest and mesa top, but none was as vital as the yucca. The petals of its bell-shaped flowers, the pith of its stout flower stalks, and the juicy meat of its fruits were eaten. Part of its heavy root was made into soap. Its stiff, swordlike leaves were softened by soaking in water, then pounded with stones to loosen the strong fibers within. From these were made baskets, bags, cords, nets, snares, and sandals. The sharp points of the leaves were used to make holes in rabbit skins and rawhide, and other parts of the leaf were used as paintbrushes. A great advantage of staying in one place was that traders, who regularly traveled among the Indian peoples of the Southwest and Mexico, knew where the Mesa Verde Anasazi were and included them among their customers. We don’t know how or when pottery was first introduced. Perhaps a trader arrived from the south with a vessel of fired clay. It was strong, it was beautiful, and it could hold water far better than the best baskets. Perhaps he left it in trade for baskets, or perhaps he simply answered questions about how it was made. In any case, there must have been great excitement afterward, as the women began to experiment with this new material. They learned to mix clay from the soil beneath their feet, to roll it between their palms into long ropelike strands, and to coil these, one atop another, into the shapes of dishes, bowls, and larger vessels. They smoothed these creations inside and out, and they decorated them. When meat was needed, the men took their stone-tipped spears and spear throwers, or atlatls, and went hunting. Surely they sought help through chanting and prayer, for the atlatl was not an accurate weapon. It was merely a short piece of wood, cupped at one end to hold the base of a spear; but properly used it lengthened the thrower’s arm, adding a joint to it and greatly increasing the power of a throw. Rabbits were the usual game. The skins were sewn together to make blankets; tools were made from the bones. On those occasions when a mule deer was brought down, the clan set to work on the carcass. The fresh meat was stripped and allowed to dry for winter rations. The skin became rawhide leather, some of which was sliced into throngs for binding stone blades to wooden handles. Sinews became a tough thread. Bones were broken and fashioned into such tools as awls, punches, needles, and fleshers for removing meat from hides. Antlers were used as pressure tools in making stone blades or spearheads. 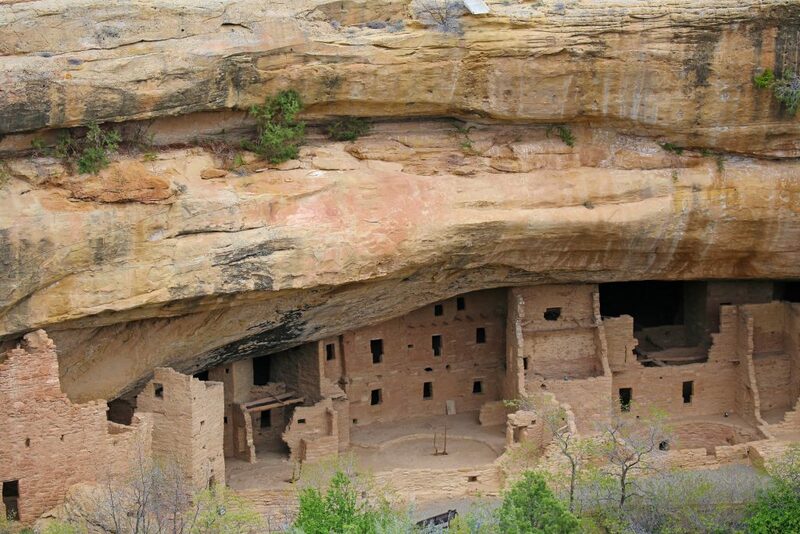 Check out these great Mesa Verde NP Travel Tips!